NEW 2018 VERSION Indoor Amplified HDTV Antenna 60 Mile Range! 1) Place the antenna, preferably on a window or as high as possible. 2) Connect the HDMI cable from the amplifier to the TV. 4) Go to the menu on your TV and make sure it is set for "air" or "antenna", whichever you TV menu has. 5) In the menu on your TV go to "Scan for Channels" or "Channel Scan" etc., select "ok" and scan. This may take up to 20 minutes to complete. The actual receivable range may highly dependents on your distance and location.Areas with large obstructions such in valleys, mountains,etc,. will reduce effective range. You can adjust the amplifier to short range if your house is within 20 mile range from the tower. We do NOT Recommend to use this amplifier or booster if your house is very closer to the broadcast tower and the signal is already very strong. 1. Check to make sure you have correctly connected the hd antenna to your HDTV or third-party HD receiver. 2. Re-scan for channels: In the TV's setup menu, set the mode to hdtv antenna or air. Refer to the TV manual for detailed instructions. 3. keep the hdtv antenna away from those big power consumption devices interference, such as air conditioner, refrigerator and microwave oven,etc. We are confident in the quality of our product and give you great customer support! ☑FREE CHANNELS: Free for life,never pay hugely expensive cable or satellite fees again! You can get access to FREE HD programs forever including ABC, CBS, NBC, PBC&Fox in 60mile rang from Broadcast Tower, start to access all of the news, sitcomes, kids amd sports programs! 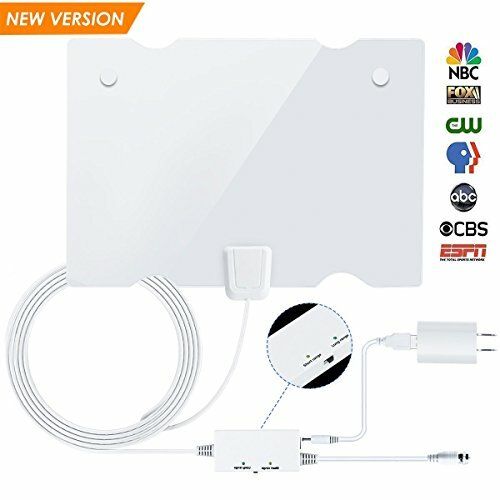 ☑60 MILES RANGE ,EXTRA LONG 16.4FT COAXIAL CABLE ：Slim and light with thick no more than 0.02".Makes indoor antenna easier for you to place it in your house to get the best reception, especially for customers whose televisions are quite far away from windows.The Upgraded Version Digital TV antenna support Format:720p, 1080i, 1080p,4K&Frequency Range: VHF 47-230MHz, UHF 470-862MHz. ☑NEW VERSION AMPLIFIER : The reception of this HDTV antenna has optimized to the most resonable condition,2 switchable amplifier modes，which the gain of the amplifier is generally higher than that of the 2-4DB. The reception of this antenna can be claimed to be the Latest Technology in 2018, which the reception upgrated 5-10% than the last version. ☑WHAT YOU GET: Sendcool HDTV Antenna with 16.4ft coax cable, USB power adapter, USB cable, amplifier signal booster. Together with 30-day full refund and 12-month warranty with friendly customer service. If you don't satisfied with the channels you get, feel free to contact us. If you have any questions about this product by Elivebuy, contact us by completing and submitting the form below. If you are looking for a specif part number, please include it with your message.